Also referred to as a retail infrastructure bond, M-Akiba bond is issued by the Government in order to enhance financial inclusion for economic development. M-Akiba bonds are government products through the Central Bank of Kenya (CBK) under the National Treasury in partnership with Central Depository Settlement Corporation (CDSC), Kenya Association of Stock Brokers & Investment Banks (KASIB), Mobile Network Operators, and Nairobi Securities Exchange (NSE). The money raised from the bond is used to fund government infrastructural development projects (new and ongoing). The M-Akiba bond project is aimed at encouraging a savings and investment culture by Kenyans. Currently, Kenyan savings stands at 11% of GDP as compared to such as Qatar who are at 60%, Rwanda and Uganda are at 22% each. Common citizens now stand a chance to loan the governments as the minimum investment amount in government instruments has been cut down to Ksh 3,000 with increments of Kshs 500 from Ksh 50,000. M-Akiba has drastically reduced the process of buying government bonds as compared to the lengthy bureaucratic traditional process where individuals seeking to purchase bonds had to get an account with the Central Bank of Kenya (CBK). Is M-Akiba Bond a good way to invest your money? Because of the 10% yearly rate of return, Kenyans may feel that it is not a wise way to invest for a long term. Let me warn you, M-Akiba bond is a remarkable opportunity for you to save money, and at the same time earn attractive interest rates from the Government. The interest rates on M-Akiba bond are considered to be tax-free which makes the return on investment much higher than say, dividends, which are subject to a 15% withholding tax, or other income that is subject to as much as 30% income tax. M-Akiba bond a good way to build savings over time is you keep on reinvesting the interest that you receive. Are M-Akiba Bonds Risk or Safe? Kenyan government treasury bonds are indeed risk-free for individuals who hold individual bonds until maturity. The risk only comes to those who sell their bonds prior to maturity or who invest in long-dated treasury bond. As a result, even this “risk-free” investment can, in actual fact, be quite risky in certain situations. 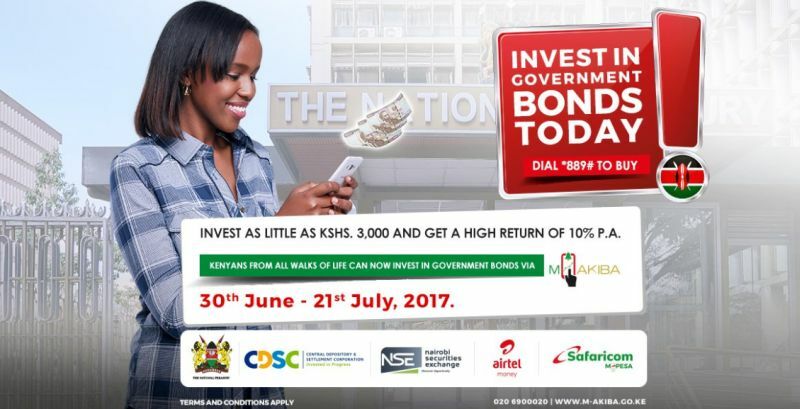 Purchase of M-Akiba bond is now open until 21st July 2017 at 12 am. Purchases can be made through Mobile banking or the PesaLink inter Bank transfer service. To register, dial *889# from either your Safaricom or Airtel line and then open a central depository account on your mobile phone to purchase the bond. Interest rates are payable every 6 months and upon maturity of the bond, the principal amount you invested and the interests you have earned from the bond will be paid in a lump sum through your mobile. After purchasing the bond you can continue buying in the subsequent periods up to the date of closure of the issue or when the targeted amount is reached. Currently, the daily limit that you can bid is set at Ksh 140,000. Bonds can be bought with a minimum amount of Ksh 3,000 and up to the maximum amount of Ksh 140,000 per day. If you happen to miss purchasing the bond in the primary issue, don’t despair as you will still have the option of buying it in the secondary market at the Nairobi Security Exchange. Note: Purchase of the bond in the secondary market is determined by market forces. The interest rate on the bond is higher than the interest rates payable on small deposits by commercial banks and other investment channels.